The LTER Network Graduate Student Committee (GSC) is emerging as a strong voice for graduate student involvement in Network activities and the development of new graduate student opportunities. The accomplishments of 2004 highlight the successes of members of the GSC in fostering these goals. The First LTER Graduate Student Collaborative Research Symposium will be held at the H. J. Andrews Experimental Forest Station in Blue River, OR, April 13–17, 2005. Symposium preparations are progressing apace with the assistance of Symposium Committee members Harmony Dalgleish, Stephanie Oakes, Chelsea Crenshaw, Tiffany Troxler Gann, and Robert Daoust; H. J. Andrews Experimental Forest; Oregon State University; Florida Coastal Everglades; and Florida International University. The Symposium is designed to foster interactions among LTER and ILTER graduate students to stimulate their engagement in comparative and collaborative ecological research. It will serve to strengthen the role of the LTER Network in providing experiences and training to encourage present and future graduate student participation in the broader LTER and ILTER communities, emphasizing new focuses on collaboration and synthetic work. Structured over four days, the Symposium will include a short plenary address, synoptic talks focused on graduate student-led research at each of the 26 LTER sites and participating ILTER sites, individual research talks, student-led collaborative research workshops, and training sessions given by LTER and non-LTER scientists. Support from LTER sites has been excellent, with each site sponsoring the attendance of at least one of their students – a truly collaborative effort which will greatly facilitate the success of the Symposium. We also have great support from our ILTER network partners: we will have students attending from South Africa, China Brazil, Mexico, Mongolia, Austria, Switzerland, France, and the Czech Republic. LTER and ILTER graduate students submitted over 70 abstracts of oral presentations, posters, and student-led workshops. Staff members of H. J. Andrews and OSU are organizing several field trips and hikes to interesting scientific research sites. 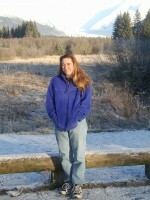 Whendee Silver, who is affiliated with the Luquillo Experimental Forest, will be the main plenary speaker. Scott Collins (SEV) will speak about the new “culture of synthesis” in LTER. Five training sessions are planned, including: “Communicating Science to Non-Scientists” by Ashley Simons at Sea-Web; and “Initiating, Undertaking, and Managing Collaborative and Multidisciplinary Research Projects” by Darrel Jenerette, who has published in BioScience on the subject of LTER interdisciplinary science. The idea for a Graduate Student Collaborative Research Symposium evolved from discussions at the LTER Student Session during the 2003 Ecological Society of America (ESA) annual meeting and from a workshop entitled “Facilitating graduate student opportunities for collaborative research” during the 2003 LTER Annual Scientists Meeting (ASM). After the ASM the symposium organizing committee asked for and received funds from the LTER Network Office to organize a working group to write a proposal for the Symposium. The working group, comprised of graduate students Robert Daoust (PIE), Tiffany Troxler Gann (FCE), Harmony Dalgleish (KNZ), Stephanie Oakes (PAL), Rachel Michaels (VCR), Evan Kane (BNZ), and Tamara Heartsill Scalley (LUQ), was held at Florida International University in Miami, FL in February 2004. The proposal writing process was greatly enhanced by the attendance of LTER Executive Committee member Nancy Grimm (CAP). In May 2004, the GSC was informed that its proposal for a graduate student symposium was being funded as a supplement to Florida Coastal Everglades (FCE) LTER. Please visit our Symposium website at http://student.lternet.edu/symposium/ for more details. In February 2004, GSC co-chairs Robert Daoust and Tiffany Troxler Gann visited LNO in Albuquerque to work with web designers Marshall White and Jeanine McGann to develop a new and improved Graduate Student website. One of the website’s most important new features is the Graduate Student Representative page, where photos and contact information for site representatives can now be found. In July 2004, Robert Daoust rotated out of his position as GSC co-chair. We welcomed our newly elected co-chair, Chelsea Crenshaw (SEV). During the ESA annual meeting in Portland, OR, the GSC held the annual LTER Graduate Student Evening Session—a panel discussion designed to facilitate interaction between LTER graduate students from various sites and LTER scientists and NSF personnel. LTER personnel in attendance included Scott Collins, Bob Waide, Don Henshaw, McOwiti Thomas, and Nancy Grimm; NSF had Henry Gholz and Sonia Ortega (then still with LNO). In November 2004, graduate students Stephanie Oakes, Chelsea Crenshaw, Tiffany Troxler Gann, and Sarah Emery participated in the “Meeting of 100” convened to, among other things, develop research questions addressing the Grand Challenges of Ecology as part of the LTER Planning Grant activities. The working groups that emerged from this meeting recognized and incorporated the participation of graduate students in the planning grant activities. We thank the Planning Grant committee for encouraging graduate student perspectives and input in the future of LTER science. Upcoming activities of the LTER Graduate Student Committee include a “Lunch Chat” co-hosted by the ESA Student Section during the 2005 ESA annual meeting scheduled for Montreal, Canada, in August. Graduate students are encouraged to register for this lunch event, which is scheduled for Monday, August 8. The Lunch Chat is popular event borrowed from the annual LTER ASM and a great opportunity to interact with some of Ecology’s leading scientists. The GSC will also co-host a session of the ESA Student Section that evening. We look forward to the opportunity to meet LTER and ILTER graduate students enthusiastic to develop new relationships to facilitate collaborative research in LTER during the First LTER Graduate Student Collaborative Research Symposium. We hope to see the Symposium instituted by the LTER community and become one more reason to pursue graduate student research with the LTER Program.